2018 marks the 92nd anniversary of the Macy’s Thanksgiving Day Parade. The parade costs an estimated $11.6 million to $13.4 million every year. About 3.5 million people are expected along the parade route. The Macy’s Thanksgiving Day Parade is rapidly approaching, which means the streets on NYC will soon be choked with millions of visitors all hoping to get a glimpse of a balloon version of their favorite licensed characters. The event marks one of the busiest days of the year for the city, which means a windfall for businesses but a nightmare for residents just trying to get from point A to B. If you’re trying to avoid getting stuck in traffic while moving through Manhattan or travelling along major thoroughfares, our best advice is: don’t even try driving on Thanksgiving Day. Get where you’re trying to go a few days early, or make plans to walk where you need to be in the city on the day of the parade. Even public transit lines get choked as people try to take advantage of cheaper parking opportunities in other boroughs. Driving runs the risk of getting slapped with a NYC traffic ticket on a day when most of New York’s finest is understandably unhappy serving as crowd control. So take care, drive smart, and use the following tips for getting around the city if you absolutely have to drive on Thanksgiving Day. 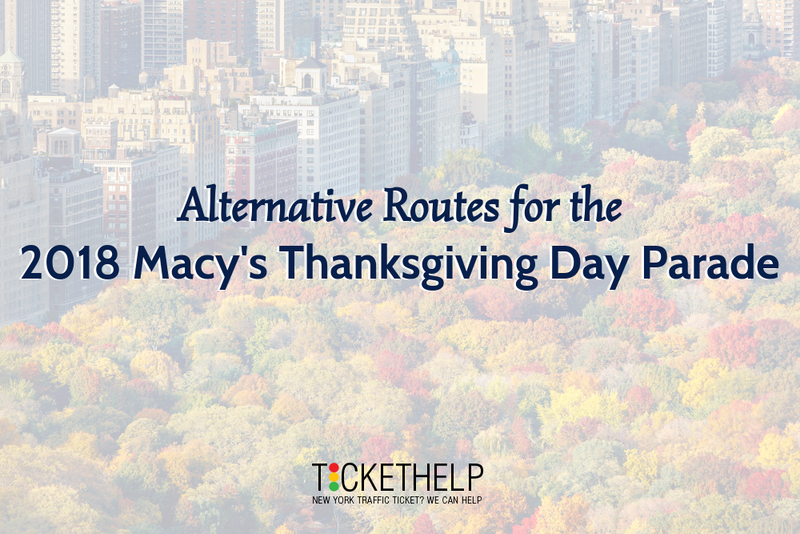 The Macy’s Thanksgiving Day parade route only stretches 2.5 miles, going from its start at Central Park West and 77th to W 34th Street just outside the Garment District. This route closes down all of 6th Avenue from Central Park to Midtown. Because of performances and public viewing stands, the city also shuts down 7th between 33rd and 40th Street as well as multiple blocks around Columbus Avenue and near 8th Ave. You can check out the official list of street closures from the NY DOT in the week before the parade, and Curbed NY has a pretty good list of Macy’s Thanksgiving Day Parade street closures based on last year’s event. Closed streets mean that the areas all around them will be backed up even more than usual. Expect heavy traffic all throughout Midtown from Chelsea on up to the middle of the Park. The FDR, Park Avenue, and 5th are likewise going to be filled with thousands of tourists, buses, crews, and city vehicles the entire day of the parade. You may have better luck traveling 2nd or 3rd Avenues compared to the avenues west of Central Park. Then again, you may have even better luck if you skip the entire middle of Manhattan altogether using the tips in our next section. Nearly 3.5 million people come to watch the Macy’s Thanksgiving Day parade, and a good portion of those come from outside the city. Their most likely point of entry will be the Lincoln Tunnel, which currently has two lanes closed after 9 p.m. every day thanks to a project that won’t be complete until 2021. You can use the George Washington Bridge or Holland Tunnel to skirt around much of this traffic, but it won’t exactly be breezy. Both are likely to be as busy on Thanksgiving Day as they are during the heaviest commutes. You can optionally sneak into the city through Brooklyn using the Verrazano Narrows Bridge. While that may feel miles out of the way, you can have luck taking the Hugh L. Carrey Tunnel up through Battery Park. Or, if you want parking, you can find a spot anywhere near where the subway’s Q line stops in Brooklyn. Those coming from Brooklyn will want to avoid the Brooklyn Bridge if possible. You can potentially find easier crossing on the Williamsburg Bridge or the Manhattan Bridge. Speaking of Williamsburg, that neighborhood and Greenpoint can present decent options for parking if you’re willing to wait on the (likely packed) E train — assuming you absolutely have to get near Midtown on Thanksgiving Day. Try to Plan Your Trip Around the Parade, Which Means Leave Early! Getting out of the city on Thanksgiving Day will be quite the trial. If you’d rather not deal with it, leave either Tuesday night or Wednesday morning after 9 a.m. People begin arriving in the city as early as possible on Thursday morning in hopes to secure a decent spot to see the parade. Expect some traffic even before 6 a.m.
There’s also the pre-parade balloon inflation that happens along Columbus between 73rd St. and 81st the Wednesday night before. Traffic can already pick up around this time, and the city closes off many blocks along the parade route after 9 p.m. just to get everything ready. If you live in another area and want to see relatives in Manhattan for Thanksgiving, consider staying the night before. Remember that typical MTA bus routes will also be affected by road closures and congestion. Getting back in the city after the parade is somewhat easier compared to getting out beforehand. Even still, many intersections in Midtown get gridlocked, and the FDR can look like a parade of its own. Be patient, and again realize that staying put rather than trying to travel during these times is most likely your best option. The city that never sleeps will be especially sleep deprived on Thanksgiving Day. You can expect NYPD and other traffic officials to be diligently monitoring roads for illegal maneuvers or people trying to skirt around closures. You’re also going to see plenty of fender benders. In other words, police may be looking for chances to issue tickets. Need to pay for that parade somehow, right? If you do get an NYC traffic ticket on Thanksgiving Day — or any time of the year — remember you can fight it. Simply contact us using our phone number above or our simple contact form, and you’ll receive a case evaluation. Have fun this Thanksgiving Day, drive safe, and if you do happen to get stuck in congestion, just pretend you’re part of a very slow moving parade!